Salix viminalis L. Sp. PI. 1021. 1753. 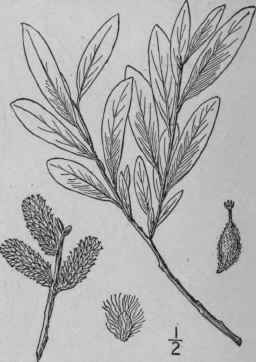 A small slender tree or shrub, with terete green twigs. Leaves elongated-lanceolate or linear-lanceolate, long-acuminate at the apex, sparingly repand-crenulate or entire, revolute-margined, short-petioled, dark green and glabrous above, persistently silvery-silky beneath, 3'-6' long, 2"-%" wide; stipules narrow, deciduous; aments expanding before the leaves, dense, the pistillate 2'-3' long and nearly 1/2' in diameter in fruit; stamens 2; filaments glabrous; style longer than the stigmes; capsule narrowly ovoid-conic, acute, silky-pubescent, about 3" long, very short-pedicelled. 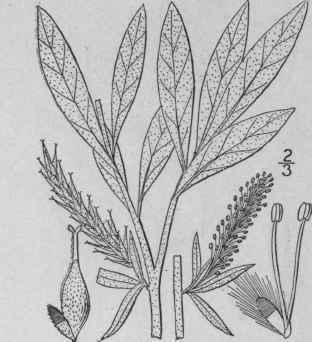 Cultivated for wicker-ware and occasionally escaped into wet places, Newfoundland to Pennsylvania. Native of Europe and Asia. Common osier. Twigwithy. Ausier. Wilgers. April-May. Salix Candida Fluegge; Willd. Sp. PI. 4: 708. 1806. An erect shrub, 2°-5° tall, the older twigs red or purple and terete, the younger densely white-tomentose. Leaves mostly persistently white-tomentose beneath, green and loosely tomentose or becoming glabrate above when mature, oblong or oblong-lanceolate, thick, sparingly repand-denticu-late or entire, acute at both ends or the lower obtuse at the apex, 2'-4' long, 3"-8" wide, their margins slightly revolute; petioles 1 1/2"-2" long; stipules lanceolate-subulate, about equalling the petioles, deciduous; aments expanding before the leaves, dense, cylindric, the staminate about 1' long, the pistillate 1'-2' long in fruit; bracts villous, persistent; stamens 2; filaments glabrous; style filiform, red, three times as long as the stigmas; capsule ovoid-conic, acute, densely tomentose, 2 1/2-3" long, very short-pedicelled. In bogs, Newfoundland to Athabasca, Wyoming, New Jersey, Pennsylvania, Iowa and South Dakota. Hybridizes with S. petiolaris and S. cordata. May. S. pellita Anders. Vet. Acad. Handl. 6: 139. 1867. A shrub, 5°-8° high, or sometimes a small tree, the twigs reddish to olive-brown. 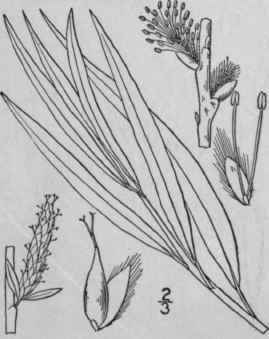 Leaves oblong, lanceolate or oblanceolate, 1 1/2-4' long, entire or obscurely crenulate, acute at both ends, or bluntish at the apex, bright green and glabrous above, pale and satiny-pubescent or nearly glabrous beneath, short-petioled; aments on short leafy branches, the pistillate ones becoming 2' long in fruit; stamens 2, glabrous; bracts villous; capsule densely white-pubescent, 2"-25" long, short-conic with a rounded base, very short-pedicelled; style longer than the stigmas. Along rivers and swamps, Quebec to Manitoba, Maine and Vermont.